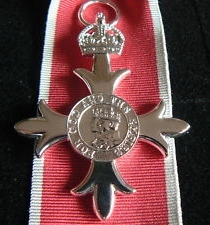 (CNS): In her 2012 birthday honours list the queen has handed out two MBEs as well as one Overseas Territories (Police) Medal to Caymanians. The governor has named two more to receive the Cayman Islands Certificate and Badge of Honour. Martyn Bould, chair of the CNCF board chair, and Dr.Sook Lee Yin-Eccles, who is medical director of the Cancer Society, have been made MBEs for their respective services to cultural preservation and medicine and charitable organisations. Davis Harrison Scott, asenior officer with the RCIPS, received the OTM for meritorious service. Meanwhile, Governor Duncan Taylor has named Nicole Tyson-Petit and James Young Scott as CERT Hons for their work in government and the construction industry. These awards simply don't count any more especially when you got our Grand Premier handing out such prestigious and distinguished wards like Order of Merit 7th degree "Article Dan" to his pioneers of political suffrage To hell with dem colonial pilgrims Ribbons and buttons! made for the knick nack kitchen junk drawer. Nothing matters here on Cayman, especially the law and good governance, accountability, responsibility and fiscal prudence. At least those awarded are acknowledged to buck the normal trend and have actually done good in their lives for the betterment of Cayman. It's easy to sit and criticise or pour scorn on a culture and tradition, its much harder to earn the respect needed to get that award or be acknowledged as a worthy member of society. What did you do today that has bettered the lives of others? Didn't think so. Jacky Backside from Oldbush. Your just jealous. Stop it and I say be nice now. If you had gotten one your mouth would not be able to hold you teeth with the smile. Live and let others live. Congrats Dr. Yin! Well deserved! I wish you were right, but unfotunately it does and its current incarnation is more insidious than all of the previous versions put together. One of their greatest successes is convincing us otherwise, but there you have it. Tough luck, as British Citizens you're a part of it as well, tee hee. And Queen Victoria is dead but people still can be awarded the Victoria Cross. Between your ears obviously, muppet. Pardon my British.